Content audits are about as popular as colonoscopies but they’re just as necessary to health – in this case, the health of your content marketing strategy. What if you could do a content audit in only a few hours? Impossible, you say. Consider a condensed content audit. It’s a fresh approach that allows you to more regularly provide actionable insights into what type of content is performing best to inform your upcoming activities. Condensed content audits are not meant to replace the comprehensive content audits you should do every year. The condensed content audit is a shortened form of the traditional content audit. It forces you to narrow your most important goals and determine whether they are being achieved – and how to improve what you’re doing. Condensed content audits are designed to be done more frequently, preferably monthly or as often as you have the time. With this in mind, here is how to do a content audit in three steps and in just a few hours – maybe even less. Before I delve further, let’s get one thing out of the way – the condensed content audit is flexible. The point is to set in motion the opportunity to evaluate your content more regularly. Narrow your attention to the most important metrics that connect to your goals at the time. By looking only at a handful of metrics at a given time, you can draw insights more easily. Perhaps you want to measure conversion data. Maybe you want to measure traffic. Maybe you want to measure engagement (such as time spent on site or social shares). You could even assess aspects of your SEO strategy. TIP: When regularly conducting condensed content audits, you can pick the same metrics each time or pick new ones depending on your goals at the time. Screaming Frog can do the inventory legwork by automatically crawling your website to collect URLs (along with title tags and title tag length, which you may or may not need). If your site is large, select 30 or 40 URLs, as that’s typically enough to draw trends. Pick the URLs connected to a category you’re most interested in learning about. For example, perhaps you want to start with your oldest content. With the content identified, you can consult whatever analytics tools you need to gather the necessary data and add it to the condensed audit spreadsheet. 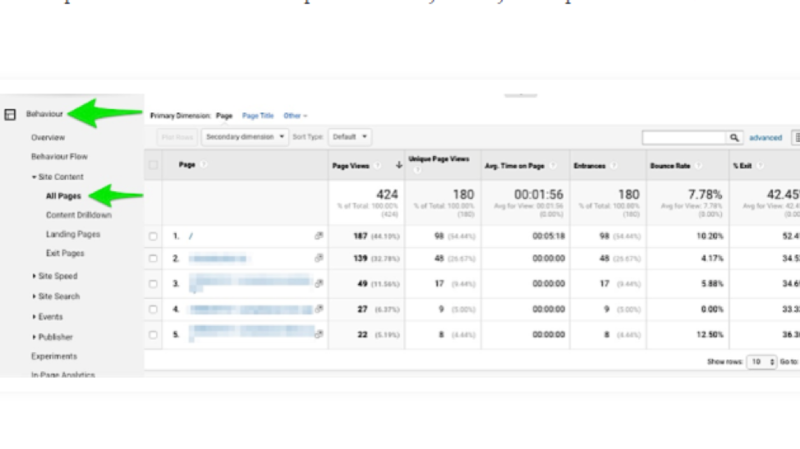 As always, Google Analytics can provide data on page visits, bounce rate, and many other metrics. TIP: In Google Analytics, export your data by clicking Export then CSV under the report title so the data can easily marry onto your condensed audit spreadsheet. The next step is to assess your data – to look for trends. For example, do you notice that people tend to spend the most time on your pages with a certain subject? Can you see what content receives the most search traffic? At this point, document your evaluation. For example, create a grading system for your content from A (top-performing) to F (poorly performing). Use the score column on the spreadsheet to track each grade. How you pick the letter grade will be based on your choice of metrics. In some cases, it may be based on objective data. For example, this content performed poorly across all three metrics and therefore receives an F rating. Or this content performed adequately in two of three categories so it receives a C. In other cases, your choice of letter may be subjective. TIP: As best as possible, detail in a couple sentences what each grade means before you begin the evaluation. That’s also helpful if multiple people are involved in the audit review. Then, use the notes column to detail possible action steps. After all, that’s the point of the content audit in the first place. For example, perhaps underperforming content leads you to conclude that some content should be updated to reflect more current information or to improve its quality. Perhaps your top-performing content should be promoted more or included as links in more related content. With the condensed audit complete, you have a road map with a few actionable steps that you can implement to improve your content marketing. The condensed content audit looks much like a typical content audit, but the pared version is designed to improve the results of your content marketing strategy more frequently. It’s flexible to your needs. Think of it as a framework instead of something set in stone. 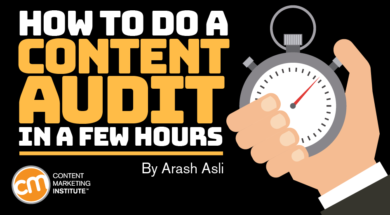 Lastly, what’s great about the condensed content audit is that it gets you and your team in the habit of doing audits more often so when it’s time to do your annual audit, it will be like second nature. Gain valuable insight into creating more effective content strategy processes and much more at Intelligent Content Conference March 20-22 in Las Vegas. Use code BLOG100 to save $100 and register today. Arash Asli is at the forefront of business growth helping SMBs grow their businesses, as CEO of Yocale.com, an online scheduling and marketing platform. His thought leadership have been featured in major publications including Forbes, Huffington Post, and Inc. Arash is honored to have been named the Business in Vancouver's Top Forty under 40 business executive. Follow him on Twitter @arash31.